Casper F. Haas, age 94 of Thorp, passed to his eternal rest on January 26, 2019 at The Homeplace in Stanley. Casper Francis Haas was born on May 6, 1924 to Casper and Lorene (Baures) Haas in the township of Worden, south of Thorp. He married Loretta Brunett on October 8, 1949 at St. Bernard's Catholic Church in Thorp. They acquired the family dairy farm in 1958, which he and his large family farmed until 1985. He also hauled milk from area farms to the cheese factory in Thorp from 1939 to 1994. 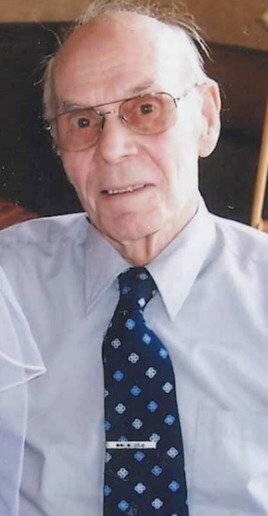 He was a lifelong member of St. Bernard-St. Hedwig Catholic Church, member of the Holy Name Society and Knights of Columbus, and served on the Worden town board for many years. Casper is survived by his children Deb (Gordon) Christians of Hayward, Ken (Beth) of Chetek, Daniel of Thorp, Beverly of Fitchburg, Phyllis of Thorp, Mike of Thorp, Brian (Jenny) of Thorp, Lois of Green Bay, Nancy of Eau Claire, Ralph (Ria) of Menomonie, Robert of Oostburg, Doris (Wade) Zachow of Eau Claire and Casper (Melissa) of Eau Claire, twenty-seven grandchildren and thirty-six great grandchildren. Surviving siblings: Bernice Seaman, David (Pauline) Haas, Dennis (Marcia) Haas and many nieces and nephews. Casper was preceded in death by his wife, Loretta; daughter, Eileen; infant son, Roger; daughter-in-law, Charlene; grandson, Jacob; and seven of his brothers and sisters. Funeral services will be held on Friday, February 1, 2019 at St. Bernard-St. Hedwig Catholic Church in Thorp, with Rev. Baskaran Sandhiyagu officiating. Burial will follow in St. Bernard Cemetery in Thorp. Pallbearers will be Casper’s sons: Ken, Dan, Mike, Brian, Robert and Casper Haas. Visitation will be held at Thorp Funeral Home on Thursday, January 31, 2019 from 4pm to 8pm, with a 7:30pm rosary service. Visitation will also be held at the church, on Friday, from 9:30am until time of service. In lieu of flowers, memorials may be directed to St. Bernard-St. Hedwig Catholic Church, P O Box 329, Thorp, Wisconsin.